After Action Reporter | Why play when you can read? Hi all. Not blogging much (hah!) these days, but I am putting up a few games videos on YouTube along with a mate. Why not come by and subscribe? We’d love to have you over there keeping us honest. The game clock ticks from D4 2359 to D5 0000, and a magical thing happens. Snow! Blanketing the battlefield, slowing down movement. It’s a good turn. By this point, my lines have assumed some semblance of stability. My artillery battalions northwest of Oberweywertz are still out on an island, and I have less security for my supply lines than I might like. (One of the points through which supply enters sits at the end of the road which runs west-southwest off the map through Waimes.) That said, I don’t have a lot of room to maneuver right now, having just gotten everything stabilized. If I had more time, and if the Germans weren’t still pressuring 1st battalion, 16th Infantry Regiment in Schoppen, I might have set them up in a defensive line from Oberweywertz to Waimes (with B and C Companies of the 26th Infantry Regiment and the 18th Infantry headquarters adding some length), but their odd advanced position will have to do for now. C Company, 703rd Tank Destroyer Battalion, which was on the hunt for German armored vehicles behind the line yesterday, has moved into Butgenbach to serve as a reserve, a luxury I haven’t yet had today. 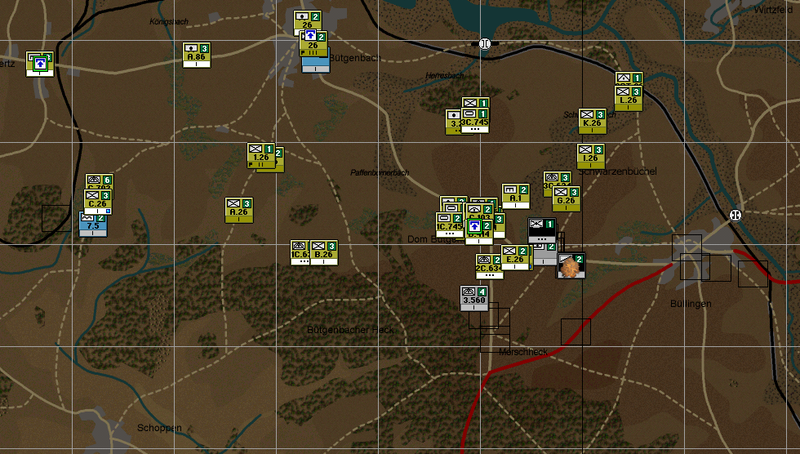 3rd Battalion, 16th Infantry’s still there, too, but I detached two of its companies and one of its attached motorized units to join the defense of Dom. Butgenbach. 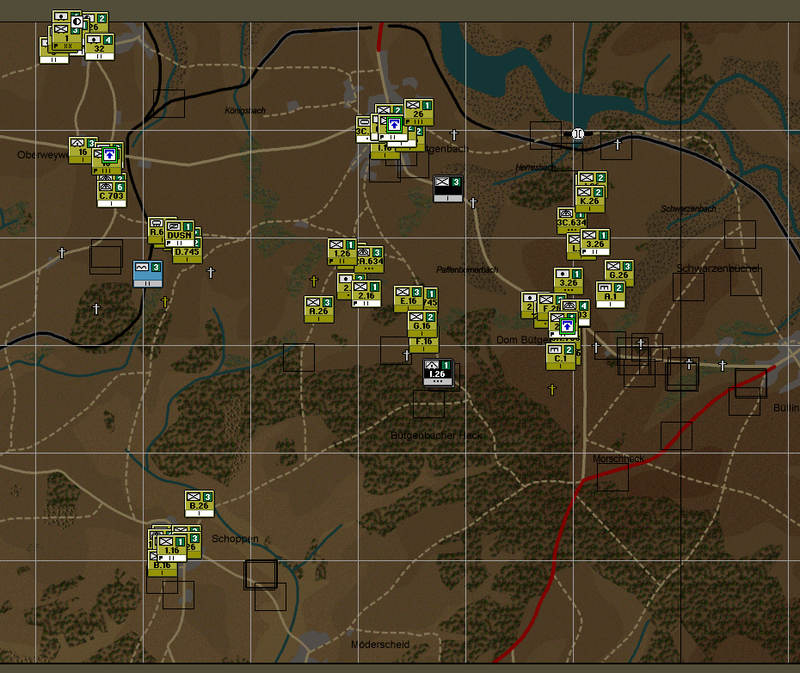 The massed German units in the woods to the southeast worry me. As 3rd Battalion, 26th Infantry starts to pull back into line with 2nd Battalion, 18th Infantry, some German infantry units stumble into it. They eventually manage to get into their new positions, after some mortar support pushes the Germans back. 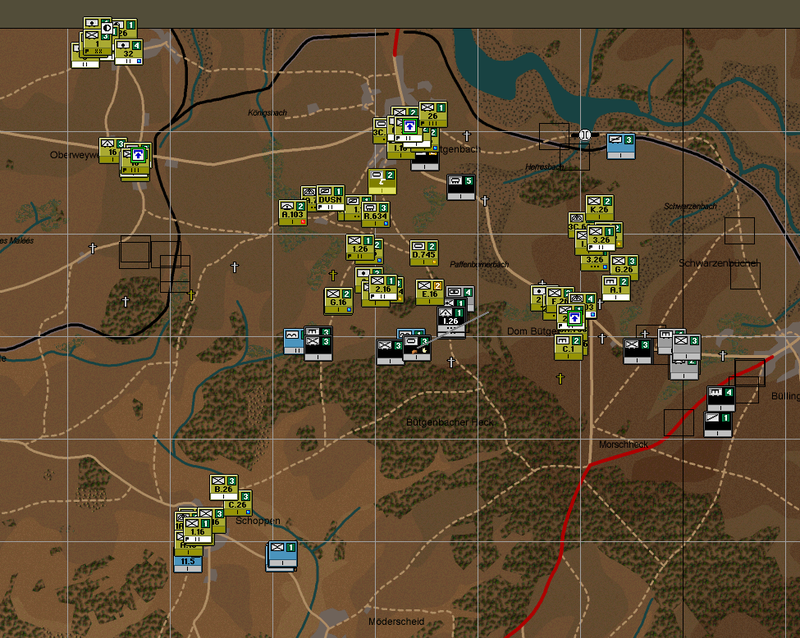 E Company, 18th Infantry has taken the brunt of the fighting, but there’s not much I can do. If the 18th Infantry’s 3rd Battalion was on my list of reinforcements, I would have brought them in to relieve 2nd Battalion, but it was not to be. 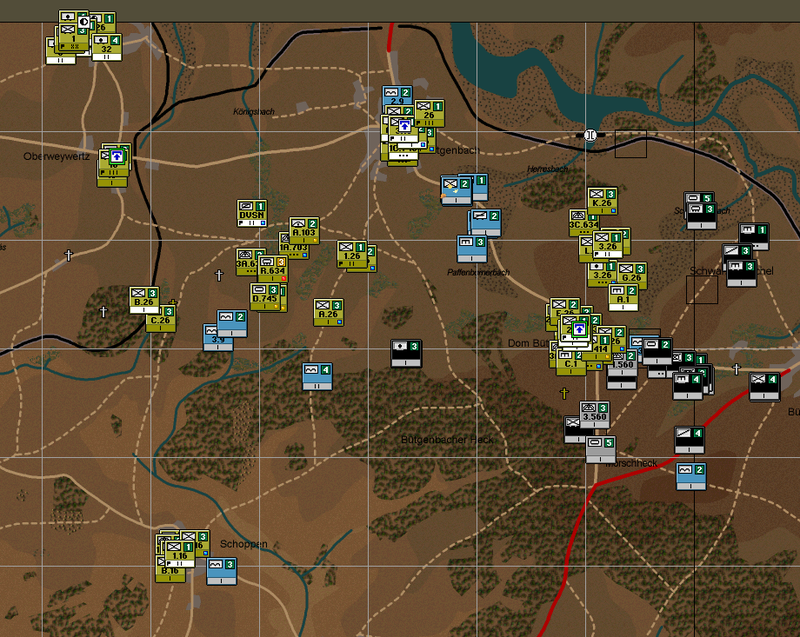 E Company is holding, at least, and I have some units I can move forward to take its place if I have to. This must be what having a reserve feels like. It’s not something I have a lot of experience with. 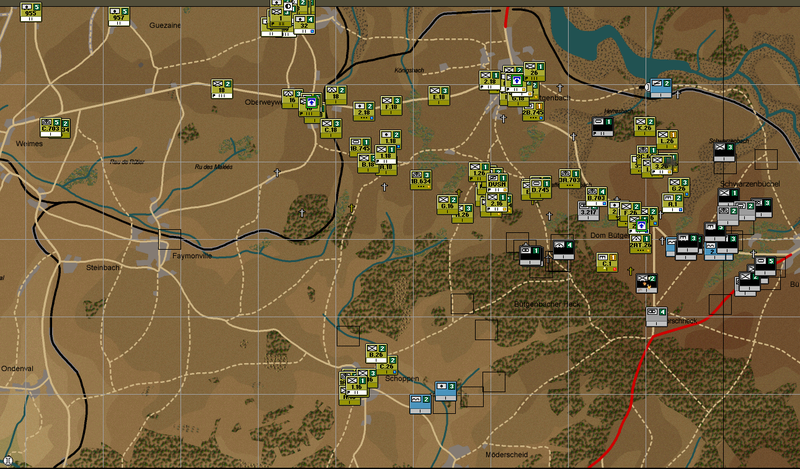 At around sunrise, I’m filled with a sense of relief: the game delivers dozens of messages to me, saying that supply has reached my front-line units, and that none of the transport columns between the supply dumps and the combat units took any damage. I think I’ve finally dealt with my infiltrators problem. The day rolls on, and there’s not a lot to say. 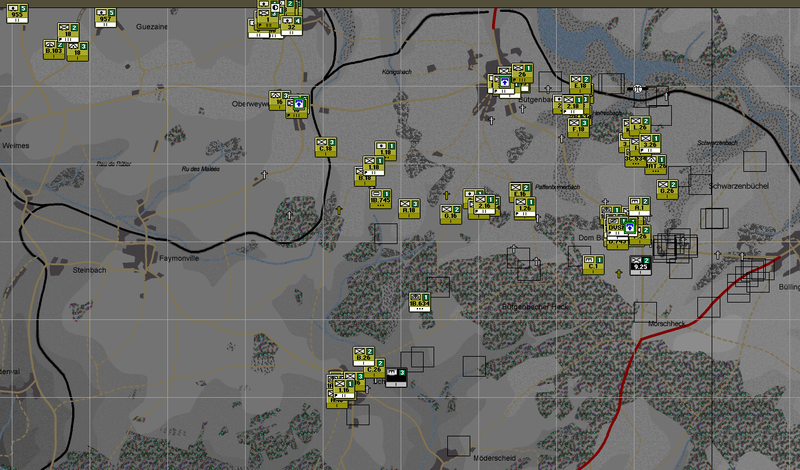 The German units massing southeast of Dom. 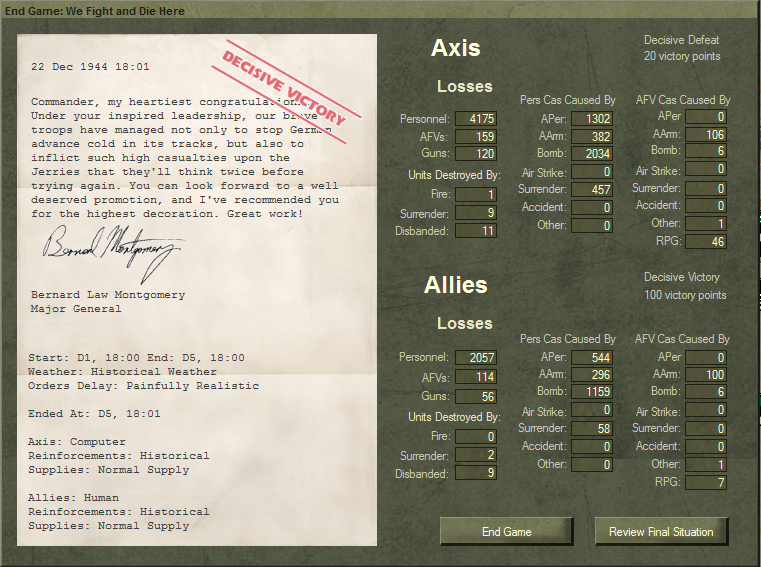 Butgenbach did indeed make an attack, and artillery broke it up. 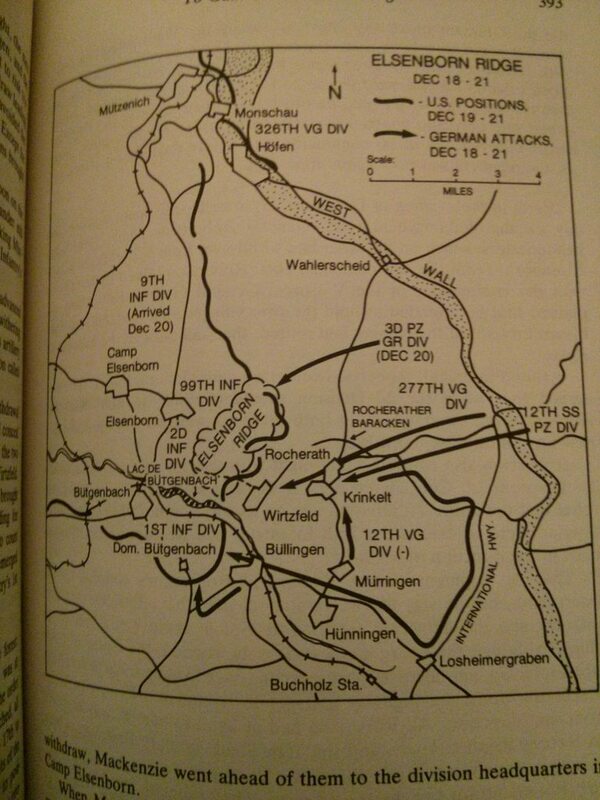 The fighting east of Butgenbach remained heavy, and 1st Company, 16th Infantry repelled a few more minor attacks. 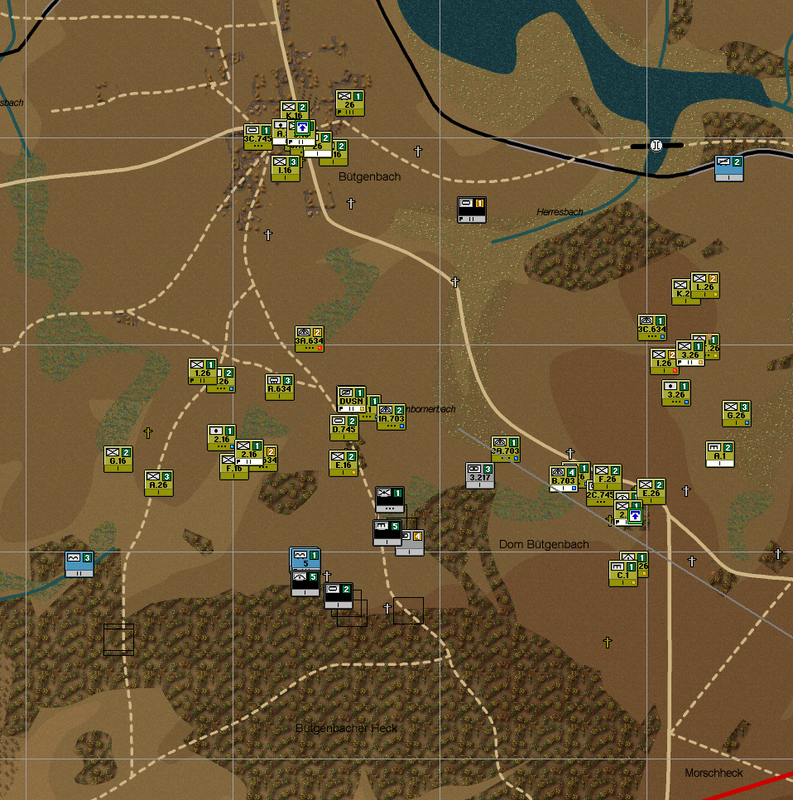 If I had been thinking ahead and if I had some time to spare, I might have directed 1st Battalion, 18th Infantry to take 3rd Battalion, 26th Infantry’s places north of Dom. Butgenbach; fresher units over there might have been nice. At 6:00pm on December 22nd (day 5), I win a decisive victory. The game-end screen provides one or two interesting points. One: although Axis and Allied losses to anti-armor gunfire came to about 100 per side, we Americans knocked out forty-six German AFVs (a classification which includes things like fighting halftracks as well as tanks) with bazookas. Five hundred of the German troops who made it behind our lines ended up surrendering; out of supply and tired, I can see why that would be. I probably would have had a harder time at it if the Germans had more artillery to lead their attacks with; as it was, the sheer weight of them got close to ruining things. It was only by good fortune that I had anything in front of the attack through the forest on December 21st, and only by a double helping of good fortune that the Germans hadn’t pinned Task Force Davisson down. (I suppose 1st Battalion, 16th Infantry played a part in preventing that.) Anyway, here’s the game-end map. I did this entry backward for a reason: in reality, as in my game, not a ton happened on the 22nd. The Germans attacked again, but they made less progress than they had on the 21st, and as the Americans dug in further, they had to face the thought that they had failed. As with many of their failures in the Battle of the Bulge (and indeed many failures in warfare throughout history), it wasn’t entirely their fault. American logistics were the turning point during the critical 21st. […] American artillery in support of the 2d Battalion, 26th Infantry, fired more than ten thousand rounds in an awesome display of firepower. it was no wonder that not a single SS-Panzergrenadier or paratrooper got past the line of foxholes. Yet the artillery would have been of little consequence had not intrepid infantrymen and antitank crewmen held their ground with incredible courage and pertinacity. [Daniel’s men] had made one of the truly epic stands against the big German offensive. 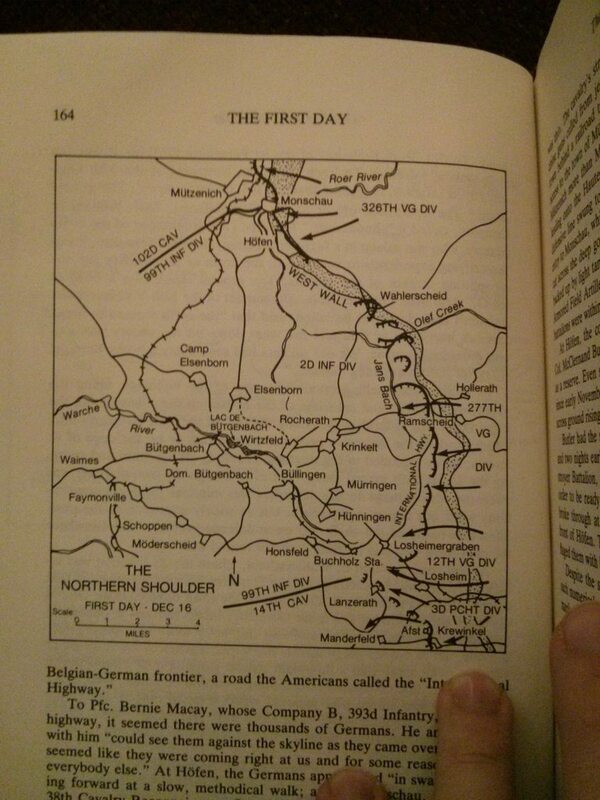 Four American infantry divisions – the 2nd, the 99th, the 9th, and our own Big Red One – held the line from Monschau in the north, down to the Elsenborn Ridge and Dom. Butgenbach, then west most of the way to Malmady. Among the infantry, the rumor went that the artillery behind them was parked hub to hub, and MacDonald says that was ‘almost literally the case.’ 348 guns of various types fired in support of four divisions, which held a solid front of about fifteen miles. If they all fired simultaneously, their targets evenly spread over that entire front, the shells would hit about seventy yards apartâ€”a curtain of shrapnel fifteen miles long. That amount of firepower, concentrated on German attacks, stopped them before they started. As MacDonald writes: “Nobody was going to get through the ring of steel those artillery pieces were capable of laying down.” And that’s about the size of it: the Americans had the men and the guns in the right place, andâ€”just as importantlyâ€”they had the trucks to keep those guns delivering their deadly payload. Thanks for another awesome AAR, Fishbreath! Derril McCollough Daniel had commanded one or another of the 26th Infantry’s battalions since the 1st Division’s assault landing in North Africa in 1942 and the 2nd Battalion since the landing in Sicily in 1943. At thirty-nine, he was one of the senior battalion commanders in a division that had long taken pride in a nickname derived from its shoulder patch, the “Big Red One.” Born in South Carolina, Daniel obtained his commission through ROTC at Clemson, the state’s agricultural and mechanical college, and then pursued advanced degrees, including a Ph.D. in entomology. By the time he entered the army as a reserve officer in 1940, he was a recognized authority on the biological control of insect pests. Digging in on the 17th and 18th and facing the attacks which started the next day, Colonel Daniel’s men had a taste of what was to come on the 21st: the day which would prove decisive. Engineers had placed antitank mines on the road into town, and Daniel had received an extra company of infantry and another ten 57mm guns as reinforcements overnight. On the morning of the 21st, German artillery fired at Dom. Butgenbach for three hours, stopping at dawn as the German attack pushed on the little town. As two battalions of SS-Panzergrenadiers approached under covering fire from at least thirty tanks and tank destroyers, each battalion taking one of the two roads leading into Dom. Butgenbach, Daniel called on his supporting artillery to place “a ring of steel” in front of his position. A total of twelve battalions responded: all battalions of the 1st and 2d Divisions; a battalion of the 99th Division (the only battalion of that division within range); and three corps battalions, plus a battalion of 4.2-inch chemical mortars. Through the entire morning, German soldiers, displaying incredible courage (the Americans saw it as fanatical), tried to break through that ring of steel, but not a man made it. They died in droves. The German tanks had more success, pushing southwest around Daniel’s battalion. Three 57mm guns faced them; they accounted for two tanks between them as the tanks emerged from the fog, before succumbing to return fire. The heroic Corporal Warner was nearby, and he bagged another, but as it caught fire, a burst of machine gun fire from the turret cut him down. That left the western flank undefended, and the German tanks were free to maraud along the line of foxholes. Two Shermans and a tank destroyer took out nine of the German tanks (the TD scoring seven on its own), but the Shermans took hits themselves, and three remaining German tanks reached cover and began to pour fire into Daniel’s command post at the manor house. Daniel called for reinforcements, and the regimental commander sent four M36 tank destroyers. They reached protected positions from which they could fire on the barn behind which the German tanks hid. Two of the German tanks made a run for it, and the tank destroyers made quick work of them. The third tank stayed where it was. Eventually, mortar fire forced it out into the open, but early evening mist concealed it on its run back to the German lines. As night arrived, the Germans called off the attack for the day. They left almost 800 dead, and about 50 of their tanks and tank destroyers littered the field. The Americans lost 250 men, four tanks and tank destroyers, and five 57mm guns. Impressed by the weight of the attack, Colonel Daniel briefly contemplated falling back to high ground closer to Butgenbach, for his position constituted a right-angle corner in the line, joining the positions of his regiment’s 3d Battalion and those of the 2d and 99th Divisions, facing east, with those of the rest of the 1st Division, facing south. Yet when [a] reserve company from the 18th Infantry arrived, Daniel reconsidered. It was he who had coined the motto, “We stand and die here,” and his men had fought by it, many of them dying in the process. There was to be no falling back. The 21st was the turning point in the real battle. As the clock turns from the 20th to the 21st, I feel like things might be turning around for me, but dawn quickly disabuses me of that idea. Something like a battalion and a half has made its way through the woods, and it’s heavily mechanized and concentrated on the weak left flank of 2nd Battalion, 16th Infantry Regiment. Task Force Davisson, coming off of enough hours of sleep to return them to combat effectiveness, rushes to fill in; that leaves some possible enemy forces un-bottled south of Oberweywertz, but between the tanks and armored cars southeast of Butgenbach and the enemy pushing east of E Company, 16th Infantry, Davisson’s needed closer to the action. Between bazookas and 57mm guns, and with some support from Task Force Davisson, the German tanks hassling Butgenbach end up wiped out, and Task Force Davisson’s presence on 2nd Battalion, 16th Infantry’s flank helps to contain the attack. You’ll notice a battalion of German assault guns which managed to get around the corner toward Dom. BÃ¼tgenbach; the little task force led by B Company of the 703rd Tank Destroyer Battalion, which originally numbered thirty vehicles, is down to fifteen or so. That still outnumbers the German company sufficiently for me to order an attack. In the afternoon, two more battalions arrive – the rest of the 18th Infantry Regiment. 1st Battalion takes up positions between Oberweywertz and 2nd Battalion, 16th Infantry, while the 18th Infantry’s 2nd Battalion heads toward Butgenbach to take up positions easy of the town, extend 3rd Battalion, 26th Infantry’s line up to the reservoir, and hopefully cut off that avenue of entry for the Germans. 18th Infantry’s headquarters elements – an anti-tank gun company and an anti-aircraft gun company – head for the road junction south of the two 155mm artillery battalions. They’ll provide security there. On the outskirts of Waimes, a reinforced company of M36 tank destroyers chase a German armored company which had interrupted a supply delivery earlier in the day. 2nd Battalion, 18th Infantry has pushed west of Butgenbach and trying to push the Germans back enough to set up a defensive line. 3rd Battalion, 26th Infantry faces heavier attacks than it’s seen to date. 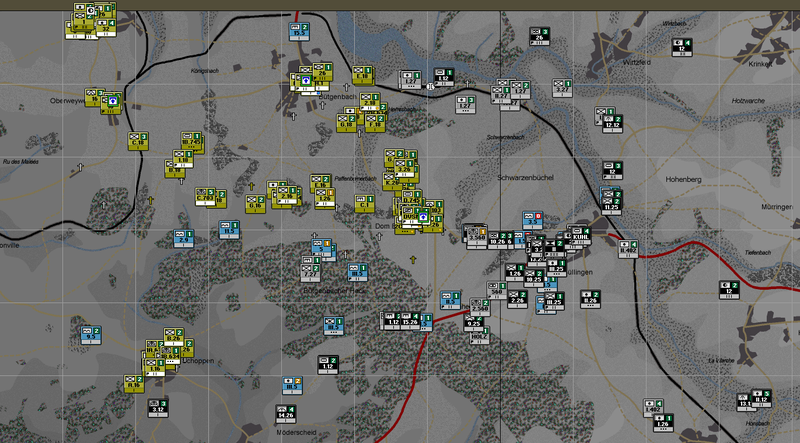 (It’s had quite a bit of attrition since the start of the scenario, but that’s mostly from German artillery fire.) Once 2nd Battalion, 18th Infantry gets into place, I’m going to order 3rd Battalion, 26th Infantry to fall back a little bit. It’s becoming a bit of a bulge in the lines, which is bad. In the center, Task Force Davisson prepares to move up to Dom. Butgenbach, where several days of constant fighting have whittled down 2nd Battalion, 26th Infantry significantly. In the west, a company of German tank destroyers heads along the road toward Oberweywertz. As the night rolls onward, the anti-tank gun company and the headquarters elements holding that town will engage it and destroy its remaining eight vehicles. More AAR from Fishbreath! Apologies for the delay – Christmas and all that. The 20th was another relatively quiet day around Bütgenbach in the Ardennes in 1944. On the night of the 19th, the rest of the 12th SS Panzer Division’s tanks, along with some surviving tanks from Krinkelt, under one Colonel Zeiner arrived in BÃ¼llingen. Soon after, ten of them plus a regiment of paratroopers and Panzergrenadiers headed toward Dom. Bütgenbach. …with eight Panthers in the lead. A shell from some source knocked out the company commander’s Panther, setting it on fire, and three more fell victim to artillery fire. Several tanks nevertheless broke into Company E’s position. [Hey, Company E! I mentioned them specifically earlier.] By the light of flares fired by 81mm mortars, the crew of a 57mm antitank gun put four rounds into one of them, sending it up in flames. The light from the flames enabled the gunner, Cpl. Henry F. Warner, to put four more rounds into a second tank, knocking it out; but after the fourth round, the breech block on the gun failed to open. As a third tank approached, heading directly for the gun, all the crew but Warner dived for foxholes. Staying with his piece, Warner tried desperately to free the breech block. When the tank was but a few feet away, the turret opened, and the head and shoulders of the German tank commander appeared. Firing his .45-caliber pistol, Warner dove into a foxhole. Still the tank advanced on an apparent collision course with the 57mm piece and the foxholes of the crew; but just as it reached the first hole, it stopped and went into reverse. Stealing a quick glance, Warner could see the commander slumped over the rim of the turret. One of my favorite facets of A Time For Trumpets is the attention which MacDonald pays to individual stories; a lot of histories get into the heads of the generals, but not as many look to the boots on the ground, and much of A Time For Trumpets’ immediacy and visceral impact stems from MacDonald’s preference for that perspective. The real Germans made those two attacks against Dom. Bütgenbach and left it at that for December 20th; mine was a little more exciting. For instance, here’s what I saw as the sun rose. Overnight, at least a battalion snuck around the north end of 3rd Battalion, 26th Infantry. The two tracks through the woods north of Schoppen have been pretty heavily traveled. Besides the mortar platoon between them, there’s armor on the eastern one, and I suspect there are more fallschirmjager on the western one. 3rd Battalion, 16th Infantry never made it through Bütgenbach; they’re still there bulking up. I end up spending most of the day in putting out fires and trying to secure the area behind my main line at Dom. BÃ¼tgenbach. 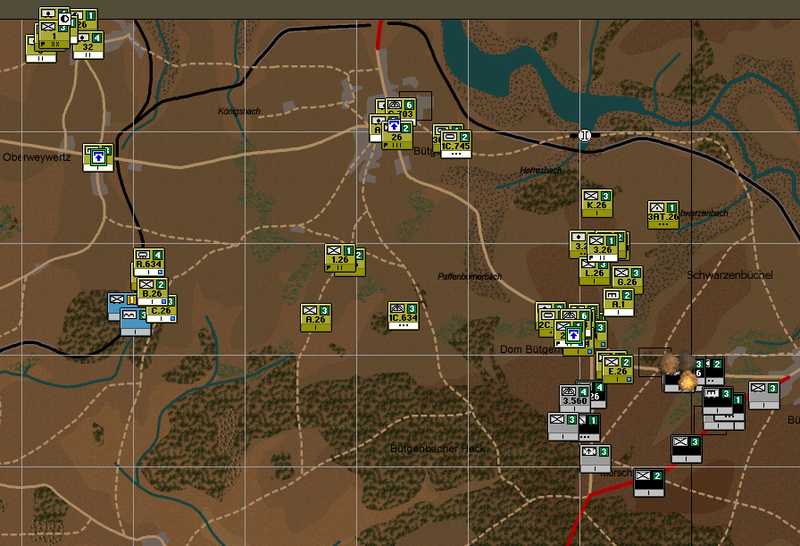 Artillery fire and stout defense ends up pushing the paratroopers away toward the eastern approach to Bütgenbach. All is not well, though. Overnight, I had to dispatch B and C Companies, 26th Infantry to help out at Schoppen, and without that outpost, a few German units have swung around to the west. On the eastern track through the forest, the armor I knew was there has revealed itself, and Task Force Davisson is in a bit of a tight spot and engaged heavily enough that it can’t extricate itself to form a better defensive line. Fortunately, earlier in the day, the 2nd Battalion of the 16th Infantry Regiment arrived, and it’s en route to take up a position between Task Force Davisson and 2nd Battalion, 26th Infantry at Dom. Bütgenbach. The artillery, rather than firing in support of the defense of Dom. Bütgenbach, has been firing to help clear out my supply lines, and I’ve lost a few hundred meters there over the course of the day, E Company, after a heroic stand at the patches of forest between the lines, had to retire toward Dom. Bütgenbach. My frantic efforts throughout the day have paid off a little: Task Force Davisson, exhausted after two and a half days of fighting, has taken up a defensive position to the west, where it’ll be a little quieter, I hope. 2nd Battalion, 16th Infantry has reached its defensive positions, and is trying a probing attack into the woods. The paratroopers south of BÃ¼tgenbach have been replaced by SS units of some kind; probably Panzergrenadiers and maybe some tanks. The infantry in BÃ¼tgenbach are well-supplied with bazookas, though, and between that and the tank detachments in the town, I’m not too concerned. Once the Panthers show themselves, they ought to be relatively easy pickings. The Germans are still sneaking around the north end of the lines north of Dom. 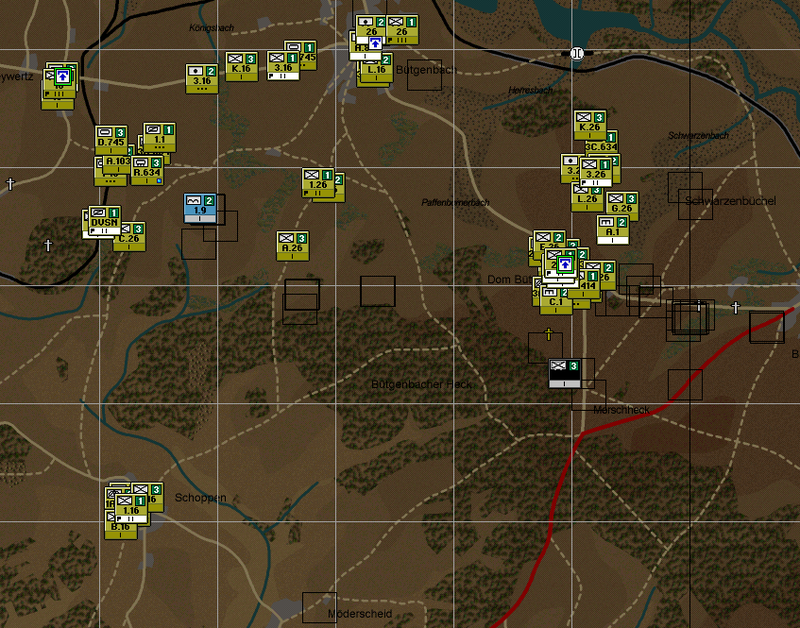 Bütgenbach, but I can’t get 3rd Battalion, 16th Infantry free of Bütgenbach to take up blocking positions there, and Task Force Davisson, my go-to unit for running all over the map, badly needs a few hours of rest tonight. MacDonald doesn’t dedicate many pages to the defense of Bütgenbach, in part, I suppose, because it’s a simple story. The Americans stood, they fought, and (spoiler) they won. The German failure at Bütgenbach doomed Kampfgruppe Peiper; as the Americans took up positions between Bütgenbach and Waimes, they could call down artillery on the road Peiper had taken further west, and that pretty neatly cut him off from supply. Peiper’s troubles are a topic for another year, though. On December 19th, elements of the 12th SS Panzer Division attacked Dom. Bütgenbach from Büllingen. The Germans probed again a few hours later, and American artillery fire drove them back. Nothing else happened on the 19th, though German artillery shelled Dom. Bütgenbach intermittently. My night proved to be more interesting. Having moved C Company of the 703rd Tank Destroyer Battalion up to Büllingen, along with two tank companies, to overwhelm an infiltrating company of fallschirmjager, I pulled another of 1st Battalion, 26th Infantry’s companies over to lend a hand to C Company. The reconnaissance company of the 634th Tank Destroyer Battalion joined in to help out, along with a cavalry reconnaissance troop (both from Task Force Davisson). At Dom. Bütgenbach, I had some heavier attacks to deal with, too, several companies of infantry and two companies or so of tanks and tank destroyers, but, although you can’t see it from here, E Company of the 26th Infantry is entrenched in a small patch of forest. Additionally, one of the many units packed in around Dom. Bütgenbach is a company of M36 tank destroyers, with two more platoons of same attached. All together, they number thirty, a potent force against any German armor which gets too close. There are a few things going on now. One of them: two battalions of 155mm field artillery have arrived on the scene (the 955th and the 957th, in the top left corner). They’ll be very useful going forward. 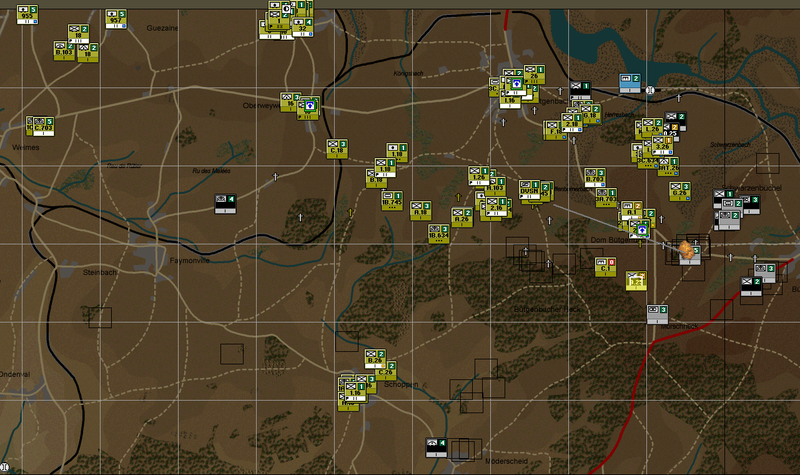 In the patch of forest east of Faymonville and north of Schoppen, you’ll see B and C Companies of the 26th Infantry facing off against a few recent enemy contacts. The 634th Tank Destroyer Battalion’s recon company and its attached reconnaissance troop have moved into a position from which they can watch for German troops sneaking along the highway southwest from Büllingen, and more paratroopers heading north through Moderscheid. Task Force Davisson has remained in Waimes, since I’ve detached so much of it at this point, and the newly-arrived 3rd Battalion, 16th Infantry Regiment is moving south to fill in at Faymonville. The 16th’s 1st Battalion is due to arrive before long, and I’ll probably use them, along with those two companies from the 26th Infantry, to clear out that patch of woods. 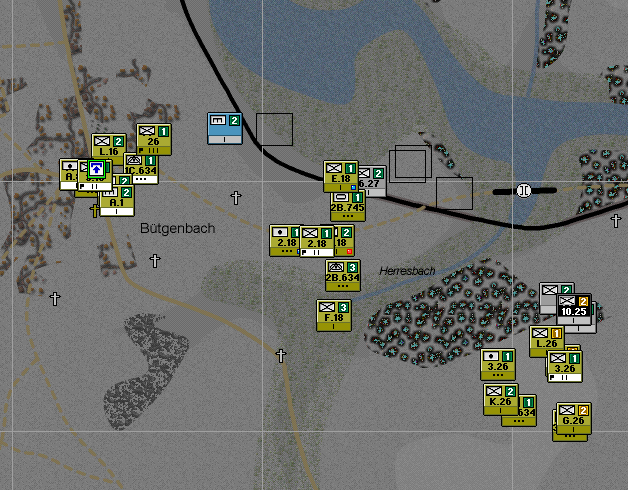 In the top right corner of the map, I evicted that infiltrating paratrooper unit, and the area around Bütgenbach is once again clear. Dom. 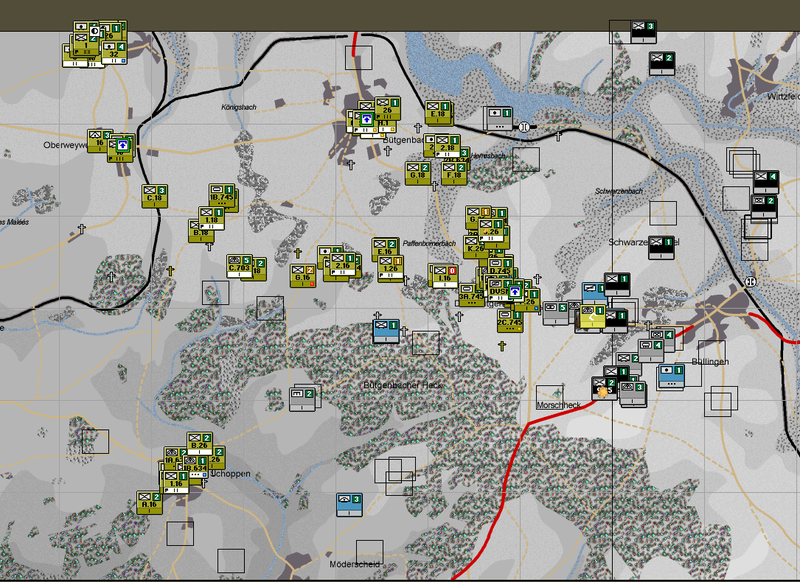 BÃ¼tgenbach is still under attack, but the artillery is keeping the situation tolerable. That situation won’t persist forever, though. That’s the supplies display for the 1st Division’s depot. Ammunition isn’t quite critically low, but it’s a little worrying, and I’ll have to be careful with my artillery – I’ll stick to short, rapid-fire barrages to break up German attacks in progress. The 3rd Battalion, 16th Infantry has dug in between Faymonville and Steinbach. Since 1st Battalion took forever to show up, I returned the 634th TD Battalion’s recon company to Task Force Davisson and ordered them to clear the woods. They ran into a few companies from the 5th Fallschirmjager Regiment and promptly routed them. At around the same time, a kilometer to the southeast on the outskirts of Schoppen, the cavalry troop has come under attack by another company of paratroopers. 1st Battalion, 16th Infantry is heading in that direction; they’ll take up positions in Schoppen and force the Germans to either sneak through the woods or take the tracks to the north. 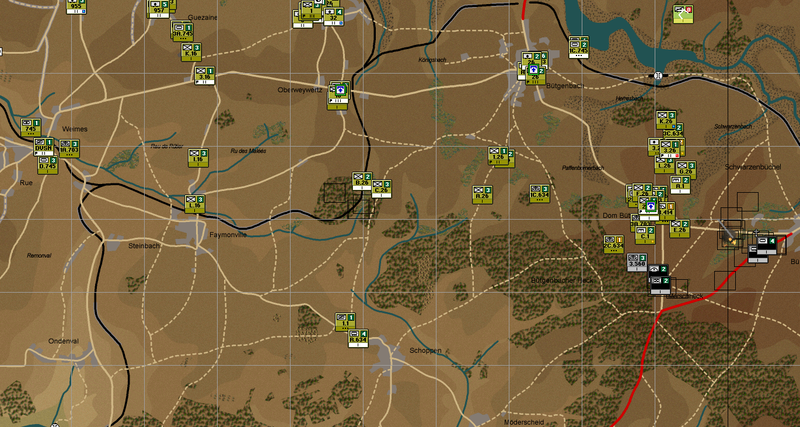 You might have noticed some troop realignment earlier: north of Dom. Bütgenbach, I pulled the 3rd Battalion of the 26th Infantry back into a tighter defensive line. They can push attacks back a little better now, but they’re also leaving a gap between their northernmost positions and the Lac de BÃ¼tgenbach. The Germans will no doubt try to sneak through there. Speaking of sneaking, they’re pushing in force along the tracks to the west of Dom. Bütgenbach, and I don’t have nearly enough stuff there right now. Task Force Davisson will handle the paratroopers directly to its east, and I pulled 3rd Battalion, 16th Infantry out of Faymonville to help plug the gap southeast of the 1st Battalion, 26th Infantry headquarters. It’s a Command Ops Christmas special! My copy of MacDonald’s excellent history A Time For Trumpets went missing, so I’m going to do my best to set this up with what I remember (and what I can look up) from last year, and what I can steal from Google Books. Oh, and Wikipedia, I guess, but I try to be better than that. You know, on that note, I’m going to direct you to read two things first. 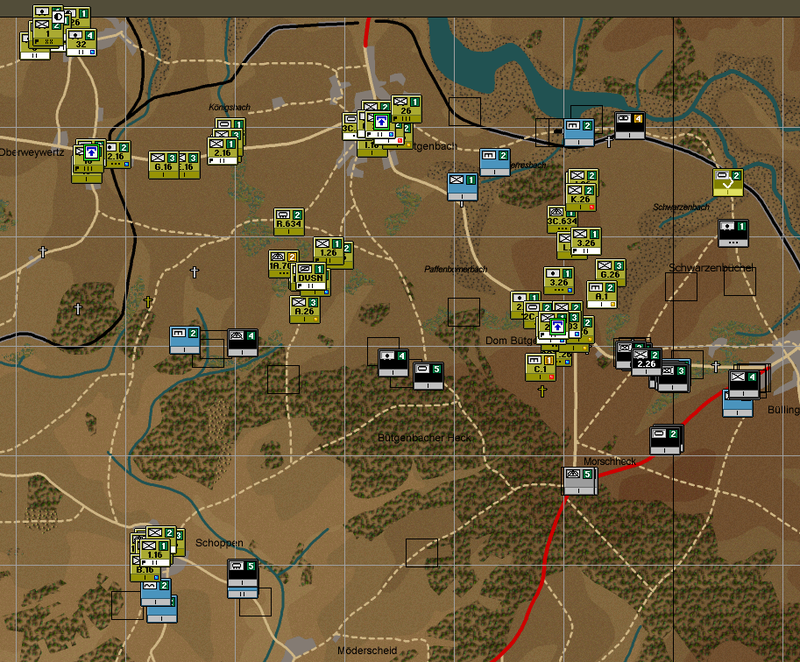 If you’re unfamiliar with the Command Ops/Airborne Assault series of PC wargames, read my Return to St. Vith AAR. That touches on how the game plays—concepts like orders delay, delegation to subordinates, and so on. The second thing you’ll want to have a look at is last year’s Bastogne AAR. The first post, certainly: it discusses the prelude to the battle, and I’m going to be referencing people and places therefrom without further explanation here. You don’t have to go further than that, but (if I do say so myself) it’s a fun read. This year, I’m going to be writing about events which transpired about forty kilometers north. Although the Germans ended up attaining their deepest penetration in the direction of Bastogne, the original plan called for the main effort to occur along the Losheim-Malmèdy axis. I’m going to digress for a minute to say that I found my copy of A Time For Trumpets, so I can show that with a picture! Anyway, the Losheim Gap, a valley at the western end of the region in Germany known as the Schnee Eifel, was the best of a number of bad choices for an attack through the Ardennes. Light forest rather than dense forest covered it, and after a few miles, the terrain opened up a hair. The two southern routes on the map—through Andler and Recht, and Honsfeld and Amblève—ran through the Losheim Gap proper. The northern three routes broke out of it. On the map, have a look at Krinkelt, Büllingen, and Elsenborn. Those are the critical points for this year’s story. Krinkelt, half of a pair of villages MacDonald usually just names Krinkelt-Rocherath, saw heavy fighting over the first two days of the battle (December 16th and 17th). It controlled access to a region of high, open ground known to the Americans as Elsenborn Ridge (around Elsenborn on the map). Büllingen and Bütgenbach were to see heavy fighting: if the Americans held the Elsenborn Ridge but lost them, the Germans could easily gain Malmèdy and push along four of their five planned routes—a setback, but not an insurmountable one. We’ll get back to that, though. On the morning of December 16th, in the sector designated for Sepp Dietrich and his Sixth Panzer Army, the offensive began much like it did elsewhere, with a thunderous, earthshaking barrage from the German artillery, and a few missteps. The plan called for two divisions of Volksgrenadiers to attack through Monschau, take defensive positions, and hold off any American reinforcements from that direction, but one of the divisions earmarked for that purpose couldn’t extricate itself from defensive positions further north. Meanwhile, bad weather and limited fuel kept more than two thirds of the paratroopers who were supposed to jump in support of the attack from their staging airfields, and none of them would drop over the battlefield on the morning of the 16th. Owing to that missing division, the German attack around Monschau faltered, but in front of Krinkelt-Rocherath, numbers favored them. Two Volksgrenadier divisions faced only five battalions of American infantry. Company K, 3rd Battalion, 395th Infantry fell victim to one of the handful of instances where the German attack closely followed the artillery. When the shells stopped falling, the German troops were already on top of Company K’s foxholes, and only one platoon survived. The other two regiments of the 99th Infantry came under attack, too, and although they held their positions, there were too few of them to prevent penetrations. Around Buchholz and Lanzerath, a scratch force consisting of a single platoon of infantry from the 99th Division and a few towed anti-tank guns crumbled beneath a determined German attack. 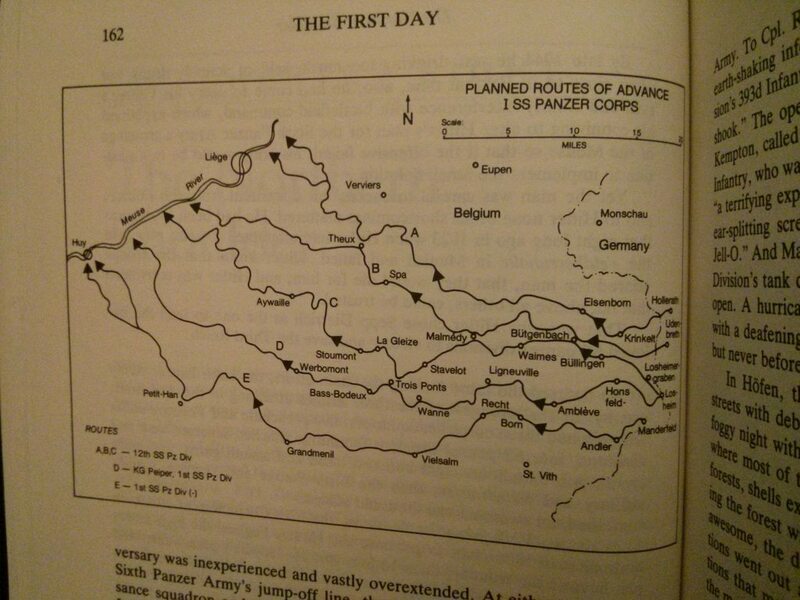 As night fell on the first day, though, the German commanders found themselves well short of their goals. When Joachim Peiper, a lieutenant colonel commanding a kampfgruppe tasked with leading the charge, found German soldiers bedding down, he quickly roused their commander, and pushed them onward. They reached Büllingen on the morning of the 17th, quickly taking it from rear-echelon troops supporting the 99th Division and the 2nd Infantry Division, and leaving those two divisions with very few options for escape. Their lines stretched between Krinkelt and Losheimergraben, the foot soldiers could march out through the woods to the northwest, but the vehicles and artillery had no choice but to take the roads through Krinkelt and Rocherath to Wirtzfeld, and from there over a muddy farm track to Elsenborn. If Peiper had turned north toward Elsenborn, he might have encircled thirty thousand men. As an American commander said, “The enemy had the key to success in his hands, but did not know it.” Peiper’s orders told him to head west for the Meuse, and so the Germans missed a golden opportunity. Still, the 2nd and 99th Divisions found themselves in a precarious spot, attritted from heavy fighting on the first day of the battle and halfway surrounded. Fighting on the second day centered on Krinkelt, Rocherath, and Wirtzfeld; with Büllingen lost, the Americans had no choice but to hold the road open so that the two divisions could fall back through Wirtzfeld to Elsenborn. To cut a long story short, they narrowly succeeded, and on the night of the 17th, the American lines began to solidify. Far to the north, Monschau had held, and the 2nd and 99th Divisions had successfully fallen back to the Elsenborn Ridge, but the Lac de Bütgenbach, a reservoir, prevented them from reaching Bütgenbach proper, and the defense of that town fell to the 1st Infantry Division. So starts our story. Sometimes called the Big Red One or the Fighting First, it had picked up the alternate nicknames the Big Dead One and the Bloody First after taking a hammering in the previous months of fighting in the Hürtgenwald. At the start of the German offensive, the 1st Divison was recovering and awaiting replacements behind the lines, but with the attack looking more dangerous and a big hole in the lines south of the Lac de Bütgenbach brought them back into the fray. On the 17th and 18th, while the fight raged over Krinkelt-Rocherath, the 1st Division had time to dig in around Bütgenbach and Domäne Bütgenbach (henceforth Dom Bütgenbach, to conform to most American sources) and scout toward Büllingen, confirming that Germans still held the town. Nothing much happened the rest of the day, and that brings us to the start of the scenario in Command Ops: We Fight and Die Here. Here’s the situation at 6pm on December 18th. Right now, the 1st Infantry Division’s forces in the area number one regiment, plus a task force of miscellaneous stuff and a few reinforcing elements. At point of interest #1 is the 26th Infantry Regiment. The first battalion faces south, west of #1, and the second and third battalions face east. The second battalion is concentrated in and around Dom Bütgenbach. Point of interest #2 marks a point I’m wary of on my southern flank. I may see paratroopers coming up from the south, and the three tracks through the forest south of 1st Battalion provide ample cover and concealment for sneaky Germans. 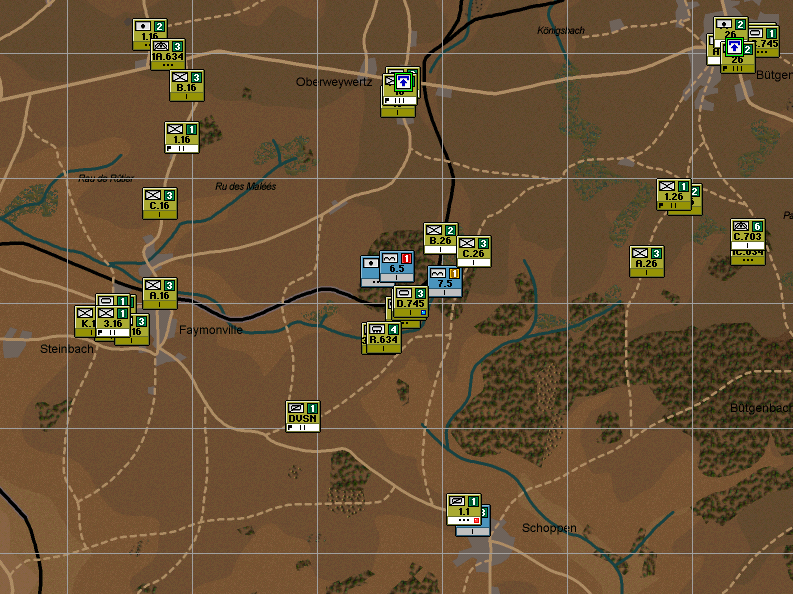 They could also march northwest from Schoppen toward Faymonville, then get in behind my lines through Oberweywertz, the objective I don’t have (The 26th Infantry holds other two objectives, Dom Bütgenbach, east of #1, and Bütgenbach proper, north of #1). Finally, at #3 is Task Force Davisson, comprising some tanks from miscellaneous units, some tank destroyers (M36 gun motor carriages, the good stuff; their 90mm guns are my best anti-tank weapon), an armored car company and a reconnaissance troop, and a unit of engineers on foot. Since all of them but the engineers have motors and wheels, my first order of business is to detach the engineer company to join the defensive line facing east. Nor does TF Davisson do me a lot of good sitting in Waimes, so I’ll move it forward to Faymonville to try to catch any tricky enemies who try to sneak around that way. As a fully-motorized force, it’ll be handy to make rapid reactions. In reality, the Germans didn’t get around to mustering an attack until the next morning. By my midnight of the 18th, however, they’ve already begun to pressure Dom Bütgenbach, and my fears of an attack around the western flank have already started to prove justified, as a paratrooper company engages C Company, 26th Infantry, and C Company, 703rd Tank Destroyer Battalion (also equipped with the M36), and an infiltrating unit engages the 26th Infantry’s headquarters in Bütgenbach. And so the first day comes to an end. It’ll probably get worse before it gets better.